Blue Man Group, celebrating 20 years at Chicago’s Briar Street Theatre (3133 N. Halsted), will usher in the spring season with an expanded performance schedule in March, April and May. The robust schedule will provide audiences with the opportunity to add Chicago’s longest-running show to their spring break itinerary. St. Patrick’s Day: Saturday, March 17 at 2, 5 and 8 p.m.
Easter: Sunday, April 1 at 1, 4 and 7 p.m.
Mother’s Day: Sunday, May 13 at 1 and 4 p.m.
Spring Break audiences looking to make the most of their Chicago experience can take advantage of a variety of ticket packages that Blue Man Group has to offer. Visitors looking to explore the city’s landmarks can enjoy special Blue Man Group packages with Skydeck Chicago, 360 Chicago or Chicago Trolley and Double Decker Company. Upon purchasing a ticket for Blue Man Group, guests can receive a free ticket to visit Chicago’s Willis Tower Skydeck (where they can step out onto one of the building’s “Ledge” glass boxes) or 360 Chicago (for unparalleled views of Michigan Avenue and Lake Michigan). 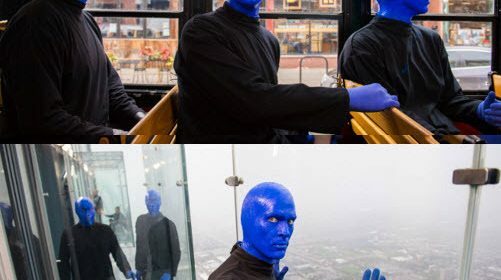 For a unique tour of the city, audience members who purchase Blue Man Group tickets can save 10 percent on single or three-day tour tickets with Chicago Trolley and Double Decker Company. Blue Man Group performances are a celebration of human connection. Mixing art, music, comedy and state-of-the-art technology, the show encourages audiences to reconnect with their inner (and outer) child and see the world through a new perspective. Three bald and blue men explore our cultural norms with wonder, poking fun at our collective quirks and reminding us how much we all have in common. Backed by a live rock band, the Blue Men unify the audience for the show’s celebratory climax – an unforgettable, euphoric dance party. A full spring performance schedule is outlined below. 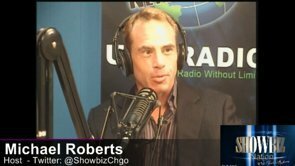 Tickets are available from $39-$99. Tickets may be purchased by calling 1-800-BLUE-MAN (1-800-258-3626) or visiting www.blueman.com/chicago. A full show schedule and ticket pricing, can also be found atwww.blueman.com/chicago. Special rates are available for groups of 10 or more, varying from $46- $69 per person. For groups of 10 or more, call the group sales department to book at: 773-348-3300 or email [email protected] to request information. Thursday, March 1 – 8 p.m.
Friday, March 2 – 8 p.m.
Saturday, March 3 – 2, 5 and 8 p.m.
Sunday, March 4 – 1 and 4 p.m.
Thursday, March 8 – 8 p.m.
Friday, March 9 – 4 and 7 p.m.
Saturday, March 10 – 2, 5 and 8 p.m.
Sunday, March 11 – 1, 4 and 7 p.m.
Wednesday, March 14 – 2 and 8 p.m.
Thursday, March 15 – 2 and 8 p.m.
Friday, March 16 – 4 and 7 p.m.
Sunday, March 18 – 1, 4 and 7 p.m.
Tuesday, March 20 – 8 p.m.
Wednesday, March 21 – 2 and 8 p.m.
Thursday, March 22 – 2 and 8 p.m.
Friday, March 23 – 1, 4 and 7 p.m.
Saturday, March 24 – 2, 5 and 8 p.m.
Sunday, March 25 – 1, 4 and 7 p.m.
Monday, March 26 – 2 and 8 p.m.
Tuesday, March 27 – 2 and 8 p.m.
Wednesday, March 28 – 2, 5 and 8 p.m.
Thursday, March 29 – 2, 5 and 8 p.m.
Friday, March 30 – 1, 4 and 7 p.m.
Saturday, March 31 – 2, 5 and 8 p.m.
Monday, April 2 – 8 p.m.
Tuesday, April 3 – 8 p.m.
Wednesday, April 4 – 2 and 8 p.m.
Thursday, April 5 – 2 and 8 p.m.
Friday, April 6 – 1, 4 and 7 p.m.
Saturday, April 7 – 2, 5 and 8 p.m.
Sunday, April 8 – 1, 4 and 7 p.m.
Tuesday, April 10 – 8 p.m.
Wednesday, April 11 – 2 and 8 p.m.
Thursday, April 12 – 2 and 8 p.m.
Friday, April 13 – 1, 4 and 7 p.m.
Saturday, April 14 – 2, 5 and 8 p.m.
Sunday, April 15 – 1, 4 and 7 p.m.
Wednesday, April 18 – 2 and 8 p.m.
Thursday, April 19 – 2 and 8 p.m.
Friday, April 20 – 1, 4 and 7 p.m.
Saturday, April 21 – 2, 5 and 8 p.m.
Sunday, April 22 – 1, 4 and 7 p.m.
Wednesday, April 25 – 2 and 8 p.m.
Thursday, April 26 – 2 and 8 p.m.
Friday, April 27 – 1, 4 and 7 p.m.
Saturday, April 28 – 2, 5 and 8 p.m.
Sunday, April 30 – 1 and 4 p.m.
Tuesday, May 1 – 8 p.m.
Wednesday, May 2 – 12 and 8 p.m.
Thursday, May 3 – 2 and 8 p.m.
Friday, May 4 – 1, 4 and 7 p.m.
Saturday, May 5 – 2, 5 and 8 p.m.
Sunday, May 6 – 1 and 4 p.m.
Tuesday, May 8 – 8 p.m.
Wednesday, May 9 – 2 and 8 p.m.
Thursday, May 10 – 2 and 8 p.m.
Friday, May 11 – 1, 4 and 7 p.m.
Saturday, May 12 – 2, 5 and 8 p.m.
Tuesday, May 15 – 8 p.m.
Wednesday, May 16 – 2 and 8 p.m.
Thursday, May 17 – 2 and 8 p.m.
Friday, May 18 – 1, 4 and 7 p.m.
Saturday, May 19 – 2, 5 and 8 p.m.
Sunday, May 20 – 1, 4 and 7 p.m.
Tuesday, May 22 – 8 p.m.
Wednesday, May 23 – 2 and 8 p.m.
Thursday, May 24 – 2 and 8 p.m.
Friday, May 25 – 1, 4 and 7 p.m.
Saturday, May 26 – 2, 5 and 8 p.m.
Sunday, May 27 – 4 and 7 p.m.
Tuesday, May 29 – 8 p.m.
Wednesday, May 30 – 2 and 8 p.m.
Thursday, May 31 – 2 and 8 p.m. Beyond the stage show, they are Grammy-nominated recording artists, known for their contributions to various film and TV scores and multiple Blue Man Group albums, including their most recent, THREE. Their “Megastar World Tour” rock concert parody played arenas across the globe. The group’s recently published first-ever book,Blue Man World, is a visually stunning anthropological exploration of the curious bald and blue character.